The game level artists really brought it in the Feudal Japan Challenge. Entrants had to create a game environment from Feudal Japan rendered in a real-time engine and with the crazy amount of talent in this category, the ones who stood out really went above and beyond the requirements for the challenge. 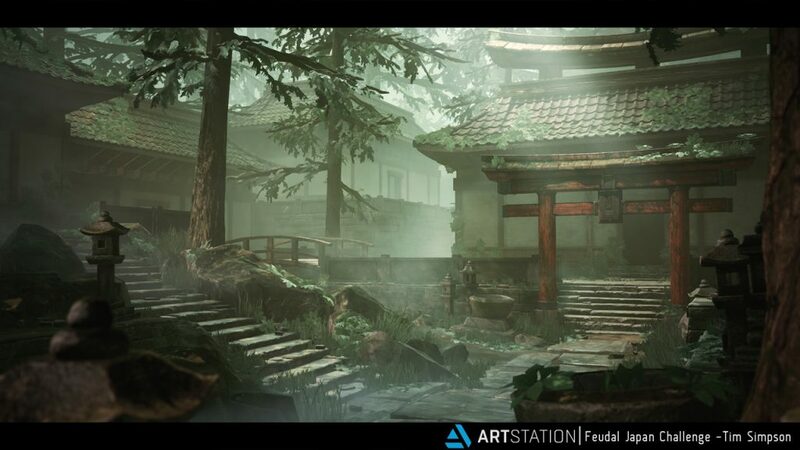 Browse all Game Environment entries from the Feudal Japan Challenge. In this interview, the winners Rudy Lamotte, Tim Simpson and Jeryce Dianingana talk about their process, strategies, obstacles and offer some learning takeaways you can apply in the next challenge. Tell us about your concept for the environment. Rudy: I decided to go with Job Menting‘s concept, because It’s a concept where the atmosphere in it is really interesting and deep and it really catch my eyes. I could see myself learning a deeper lighting mood plus working on a small scene in a forest is a change for me because I usually make large environment with a nice lighting day. Tim: For this environment I used one of the awesome concepts created by Vincent Lebocey. I instantly loved the muted color palette and claustrophobic mood. There was enough info given to create an environment that seemed like it could be made from a few re-usable pieces but also expanded into a larger scene using that small art set. I always like really overgrown and moody scenes and this one was right up my alley. The scope seemed manageable and the content and subject matter looked to offer a nice mix of man made ruins and organic natural work, so I jumped on it. Seeing a lot of the other concepts I knew there was going to be a lot of large scale, grand castles and epic scenes like that, so I felt going for something more intimate would help me stand out and attempt something I could actually finish. Jeryce: The Oni cave is a sacred place where the members of it are worshiping something ominous. Hidden, excluded and too dangerous for the living, they are lurking in a mysterious dark cave. It’s heard that you can only have a glimpse of this place during the Blood Moon. I made the decision to make my own concept because I love challenging my imagination, this is why I choose to be an artist, to be able to create what I want and especially to make something that I would love to see. My main idea was to have this oppressive, dark and mysterious environment, especially after my Wakongo which was totally the opposite. 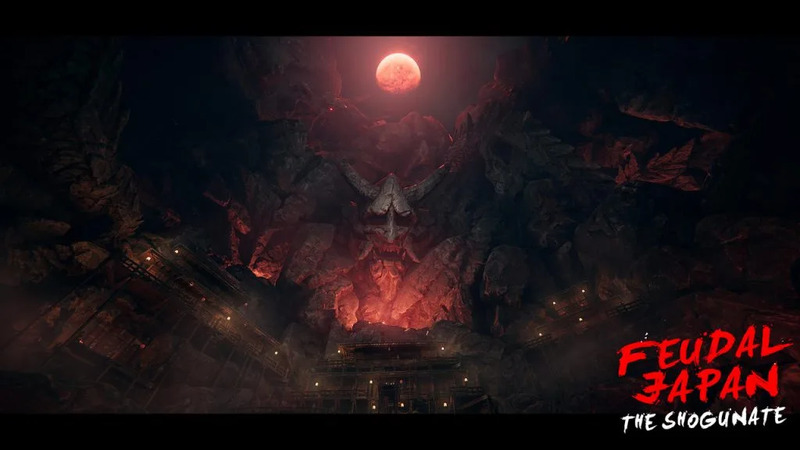 I always try to have one or two tags describing my scene to help me in my research, for this environment it was “Blood Moon” and “Cave”, I was inspired by God of war, Uncharted and Shadow of the Colossus for gigantic environments. You really feel the scale of everything and I wanted to create something huge and detailed like they do. I was also inspired by the aspect-to-aspect technique used in anime like Ghost in the Shell and other movies by Makoto Shinkai. It’s a technique based on camera shot to set the mood in your creation, to freeze the time and guide the viewers in your world. What was your strategy for completing your piece on time? Rudy: My strategy was to round up all of the references first, organized my time, and blocked things out to make them feel proportional and get things feeling good. That way if time was running out, I had to cut down some of my assets. Tim: For this project I used the same process that I try to use on any game I work on professionally or personal projects. I always work from large forms to the smaller details. That way you are focusing more on the big picture and can easily cut tiny details that no one will notice at the end of a project if time is tight, while still having the overall environment feeling fleshed out. It is a big junior mistake to get lost in the weeds producing small props because that is more “fun” rather than working on structural meshes or blocking out the scene first. With a rapidly approaching deadline it can catch you off guard if you work that way. I always push focusing on the macro (big picture) and not the micro (small details) for the most part. You can accomplish a lot with large forms and good lighting and composition. For this reason I tried to keep the overall art set small and re-usable with modular pieces and a core set of assets that I could scatter throughout the scene and still have it look interesting. I usually try to prioritize what I am working on by using my block-out to determine how much “screen real estate” objects take up and put my time and effort into the objects that are re-used a lot or take up a larger portion of the screen. This allows me to allocate time at the end for polish where I can focus on the smaller details right up to the deadline because I know I can walk away at any point and have something reasonably decent because I have taken care of the big picture first. Jeryce: To have a clear view of my scene with a good block out. Sometimes it’s hard but you really need to stick with what you have to not lose time and lock in your idea. Being able to build everything with the same elements meant a lot of modularity in my assets and being able to easily break the repetition. Rudy: I would say it was working in Substance Designer because I am not so comfortable with it yet so it was quite challenging as well as the lighting but I had a lot of fun working on this. Tim: The biggest challenge by far was creating all the foliage assets for the scene. I have had a lot of experience creating organic, foliage based environments from my time on the FarCry franchise, but on that project I was a level artist. I was responsible for world building, not building the biome assets. Luckily, I had some input from Rudy Lamotte who is an expert in biome and foliage art and this made things a bit easier even if it took several revisions. The other big challenge with this project was setting out to thoroughly document the scene via a series of youtube videos on my Polygon Academy channel. By the end of the challenge I was having a lot of fun and people seemed to be digging the content! By attempting to document and teach, I became aware of some of my weaknesses and learned some more about my own workflow in the process. Jeryce: The hardest part was the lighting. It’s really complicated to have a clear view of your elements in a dark scene like mine which is a Cave. To find the correct lighting for the other monitors and to have the right balance, you don’t want your scene to be to enlighten in some devices and not too dark. It was a real challenge. Rudy: Don’t neglect your blocking out, it’s important to get the overall mood and proportion so give enough time for this and organize your time. There is no need to rush to the final result. Don’t be afraid and move forward even if you see other great submissions. Don’t doubt yourself and your work. You can do it! Tim: Focus on the big picture, and always use that to determine your next step. Getting the entire scene roughed in up front allows you to attack it with more confidence and plan your time better, avoiding that late game scramble to finish. Try to do more with less, find creative ways to re-use or combine assets, use shaders to do work for you (like adding the moss everywhere in the scene). Play to your own personal strengths, mine are composition and lighting so I leveraged those to give my end result the “wow” factor while using fairly simple and basic meshes compared to some of the complex and uber detailed assets some other competitors created (playing to their strengths). Even if you feel like quitting, power through to the end! It’s easy to get super motivated at the start of the challenge, but over the course of the entire timeline it can be easy to lose some steam, I know I had a couple downer days. But by powering through to the end you show the ability to finish work, which is super important if you are looking to do this professionally. Potential employers are definitely dipping into the WIPS and browsing the final submissions, and your WIP thread is a great resource for showing your overall process in job interviews. I know all the positive feedback and questions from people interacting with the content helped keep me excited to keep going with the project, so it was win/win. Never underestimate the benefits of getting involved in a passionate like minded community. Jeryce: Don’t hesitate to create your own thing or to be inspired by other media like movies and anime. Think outside the box and put some fantasy in your environment. It will be hard and you will have to be really organized in your work but the feeling that you going are to feel after this is indefinable, it’s a part of your mind, it’s your art and your soul and it feels great.